Editor's note: Dear reader, we have invited a very special guest to write to you today! 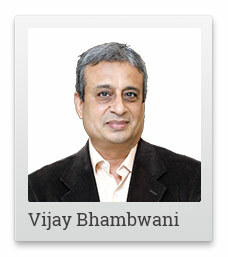 It's our great pleasure to introduce Vijay Bhambwani to our readers. We consider Vijay to be India's best trader. We're not exaggerating. We're sure you will agree with us as your read today's edition. We also promise you will hear more from Vijay soon. Enjoy! I am Vijay L Bhambwani, a first-generation professional trader, author, trading mentor, and lifelong student of the markets. Financial markets are my life and passion. Everything else revolves around my main objective - trading. My interest in the markets was aroused when I was around 14. I heard my family jeweller talk about gold prices. He spoke of how the price of gold would tend to climb before Diwali and then ease off after the festive season. I was intrigued. Understanding the method behind the madness of the markets interests me more than the profits I earn from trading itself. That is the foundation stone of my style of trading - Behavioural Technical Analysis. I've been at it since 1986. Initially, I got my toes wet by trading at the BSE. It was a very different market then. It was the public outcry system. The price discovery mechanism was very inefficient. Transparency in prices and transactions was conspicuous by its absence. You see, the markets, as you see them today, are digital, efficient, transparent. They are 'order driven'. You merely need to enter your order at the price you want to transact. Now compare this to the earlier 'quote driven' system. A floor specialist gave you a 2-way quote. The lower price was your selling price and the higher one, your buying price. The reason I am telling you this is so you understand your own trades better. I will reach out to you with more articles soon. The first few years of my trading experience was less than exciting. Like everyone else, I too depended on fundamental analysis, before making a buy / sell decision. Back in the day, companies were expected to declare only their annual results. Only the blue chips and big boys voluntarily declared half yearly results. But prices on the exchange floor changed minute to minute. That meant, for a trader, fundamental analysis wasn't enough. In 1990, came personal computers. Along with them came a select few technical analysis software & data vendors. I was early on the computer bandwagon. Before computers, we drew our charts by hand on graph papers like school kids did their homework! Updating these manual charts meant checking stock market pages of local newspapers and advancing one day at a time. If you wanted a weekly or monthly chart, you started on a separate chart paper afresh! Needless to say, it was back-breaking work. But unknown to me at that time - I realised this later in life - it set the foundation for my understanding of technical analysis. I got a whole new perspective towards trading. To a new age technical analyst, in the post computer era, pressing a key on the keyboard flipped the price charts from daily to weekly. But to an old-world technician, his mind visualised the cogs of the charts changing as the processor crunched data and toggled the compression periods. It's this minor edge that a technician who has been through the eras of both manual charting and computers, enjoys over the new age technicians. The clarity of concepts is the key differentiator. I was more or less happy with plain vanilla technical analysis till the turn of the century. This method is reactive as it instructs the trader to act post event. I was looking for a system that would be predictive (warn of an event upfront) rather than reactive. Every trader knows the importance of getting in and out of a trade early. That's an edge anyone would gladly give an arm and a leg for. By then internet connectivity was available. Imported books and literature on the subject was relatively easier to procure. Then two life changing events happened to me in March 2000. I was travelling overseas with my wife and kid to celebrate my wedding anniversary. I left open leveraged positions in the markets. The markets started collapsing after March 16, 2000. True to my word to my wife, I had blanked out the markets while we focused on sight-seeing and shopping. My Rome was burning while I was making merry abroad! The second thing that happened: I discovered behavioural technical analysis. At that time, I was already aware of artificial neural networks, quantitative methods of analysis that were newly emerging in the world of trading. Behavioural Technical Analysis was a different fish altogether. By the time I returned from my holiday, unknown to me, I was almost nearly bankrupt. I spent the next 8 years refinancing loans, making interest payments, doing TV shows, and writing newsletter columns. I gained a lot of visibility and sold paid newsletter services. No matter how much a trader has lost in the market, it is possible with hard work + smart work to get it all back over time. It's however important that every trader "loses it all" at least once. This is also known as blowing up the account). That trader will understand the trading game comprehensively. Just make sure this speed bump comes in the early part of your life rather than in your 50's or 60's. By the time I was 40, I had been on television, written columns (I love writing!) that were first of their kind in the country, taught people to trade using online systems, sold advisory newsletters, published a book, discovered behavioural technical analysis, and yes, experienced near bankruptcy. Along the way, I had picked up a few new skills. I learnt trading terminal screen reading for intraday / micro trend trading. I figured out MS Excel to automate some of the decision-making systems. My training period was over and it was time to fly again. Training young eager traders had made me a far superior professional trader because I was doing both - teaching and learning myself - both at the same time. By 2009, my book 'A Traders Guide to Indian Commodity Markets' was accepted and sponsored by the NCDEX. This was yet another first in the country. It opened new vistas for me, both in India and abroad. Champion traders and big-ticket investors were willing to meet me. They talked to me freely. We shared trading strategies and exchanged notes. They introduced me to the next step of my evolution - Neuro Behavioural Technical Analysis. I strongly believe, this is the best trading strategy in the world. I will write to about it in The 5 Minute WrapUp. I thank global thought leaders like Dr Roy Baumeister, Dr Karl Alexander, Charles Faulkner, Dr Daniel Kahneman, Dr Martin Zweig, Dr Richard Thaler, Dr Amos Tversky, Dr Hersh Shefrin for shaping my trading philosophy through their writings and their books. I combined their style of thinking with my own ideas which was more inclined to that of a combatant. I originally intended to fly as a combat pilot with the IAF but fate and family decreed otherwise. I knew from studying the Second World War that moving averages, triangle formations (armies call them pincer), and RoC (momentum oscillator), were formulated by the armed forces of various countries. If trading wasn't passive combat, what is it? I have a keyboard and mouse as my primary weapons. I use them to try and take a fellow traders money...if I'm successful. I know if I fail, they will take my money. This forms the backbone of my thought process. I improvise from time to time but the larger framework remains largely unchanged. Tomorrow, I will reveal more of my learnings to you. Thank you for reading and have a profitable day! Equitymaster requests your view! Post a comment on "A Letter to You from India's No. 1 Trader". Click here!